All of the ZBrush language settings are located in the Preferences >> Language sub-palette. The main section is about the language displayed in ZBrush. By default, ZBrush will try to detect the language of your system and if it is known to ZBrush, the software will start in the corresponding language. If your system language is not available, ZBrush will start in English. To switch ZBrush to different language, click on the language of your choice in Pref­erences >> Language. After a few seconds, the ZBrush user interface will be updated to this language. As with most ZBrush preferences, you need to save the setting by pressing Prefer­ences >> Config >> Store Config. Otherwise, ZBrush will revert to the default language on the next startup. The languages selector in the Preferences >> Language sub-palette. When working in ZBrush with a language other than English, it can be useful to switch back to English if you are following a tutorial and you need to look for a specific interface item shown in the tutorial. 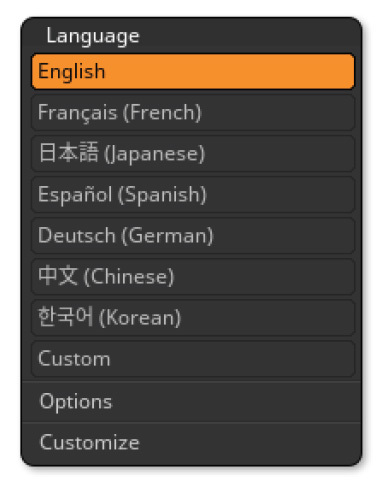 Click the Preferences >> Language >> Options >> Show English button to instantaneously display ZBrush in English. By assigning a hotkey to this button, you can readily switch between your language and English whenever necessary. Note: The English version in this mode is slightly different from the English language that you can set in preferences. The one that can be quickly displayed is what is used in the internal ZBrush source code. Some minor changes have since been made to the final language displayed when permanently setting ZBrush to display the English language. The AutoNotes are the advanced help displayed when pressing the CTRL key while hovering over a function’s UI element such as its button or slider. The English language is currently the only one provided for these AutoNotes. The other languages only have partial AutoNotes, created for select functions in ZBrushCore, the streamlined version of ZBrush. To avoid confusion, AutnoNotes are by default disabled for languages other than English. To enable them, click Preferences >> Language >> Options >> Show Notes.